For those of you who didn’t know, Ntopng is a relatively useful tool if you are looking to monitor different network protocols on your servers. It provides a bunch of tools for monitoring various protocols, traffic variants, and yes, bandwidth across multiple time frames. ntopng is based on libpcap and it has been written in a portable way in order to virtually run on every Unix platform, MacOSX and on Win32 as well. This article assumes you have at least basic knowledge of linux, know how to use the shell, and most importantly, you host your site on your own VPS. The installation is quite simple. I will show you through the step by step installation Ntopng on Ubuntu 14.04. Step 1. First, add Ntopng repo to our repo list. Step 2. Install Ntopng and dependecies. # options with no value (e.g. -v) the equal is also necessary. Example: "-v=" must be used. # Specifies the path where the PID (process ID) is saved. # tool, you probably will want to use this option. # interface id as shown by ntopng -h. On Windows you must use the interface number instead. # Sets the HTTP port of the embedded web server. # other hosts are considered remote. If not specified the default is set to 192.168.1.0/24. # even mixed together, for instance "131.114.21.0/24,10.0.0.0/255.0.0.0". # "remote" (Keep only remote hosts), "none" (Flush hosts when idle). # Disable web interface logout for inactivity. --local-networks"192.168.0.0/24" ## give your local IP Ranges here. Step 4. Start Ntopng and redis server daemon. 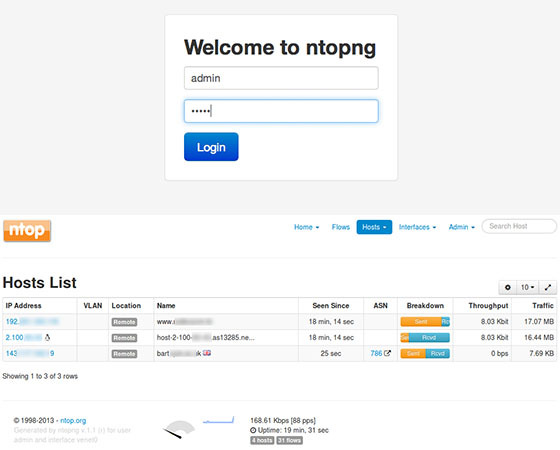 Now you can test your ntopng application by typing http://yourserver.name:3000. You will see ntopng login page. For the first time, you can use user ‘admin’ and password ‘admin’. Congratulation’s! You have successfully installed Ntopng. Thanks for using this tutorial for installing Ntopng server monitoring on Ubuntu 14.04 systems. Related Posts of "How To Install Ntopng on Ubuntu 14.04"